At Easter we got Ceri-Siân new half bike. So when we had got back from an earlier tandem ride on the Sunday to Stonehurst Farm, it was "Daddy can we now go out on half bike now?". So Ceri-Siân and I went for a half bike ride to the Cloud Trial, where we had to brew up!. Leicestershire skools used to break up two weeks before the rest of England. So we packed Ceri-Sian of to Nanny's for a week whilst Ann and I went car camping. 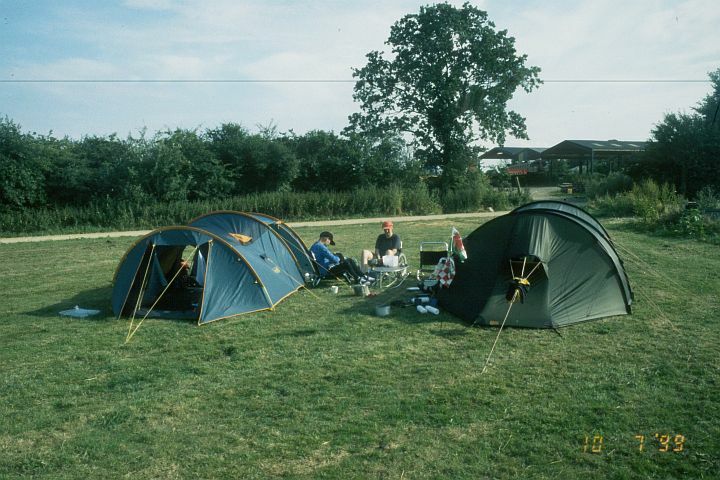 We camped a night at Hertford before heading to the Cotswolds spending a few nights at Marston Massey and then a few nights at West End, above, near the Thames at Eynsham. 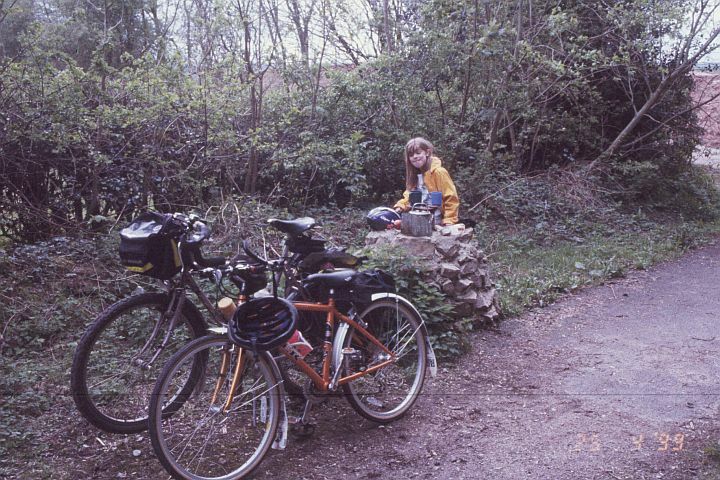 After car camping we went cycle camping with our friends Philip and Caroline Jeffery, who too had got rid of their kids! We cycled form their house to a site at Eynsham and then on to Weston on the Green above, where we entertained by skydivers dropping into the adjacent airfield. 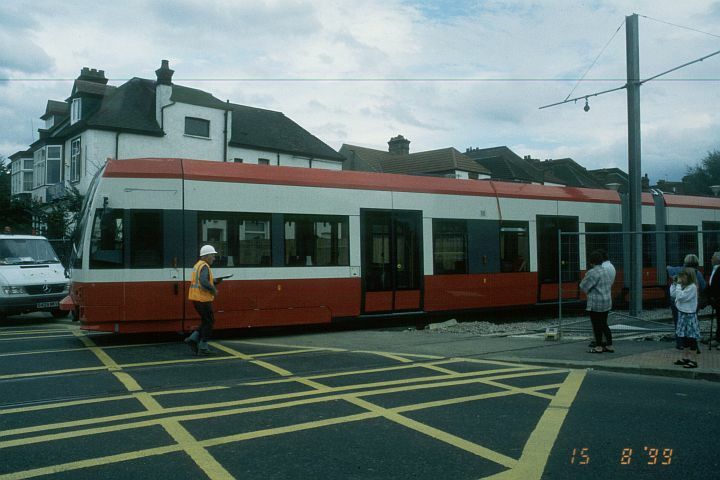 On a visit to see dad back in South Norwood, we chanced across the historic occasion of the first tram on a gauging trial in Addiscombe. Here is Ceri-Siân taking a photo of the historic occasion. Tandem 99 was in Norfolk, so we went for a fortnight and spend the week before at Reedham Ferry. 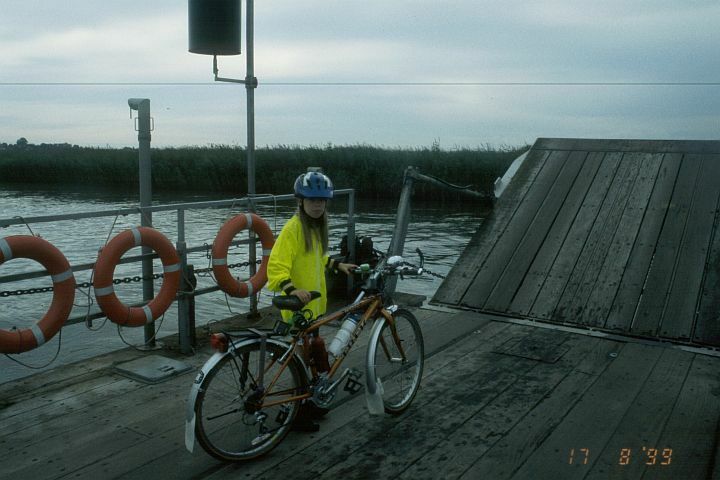 Here is Ceri-Siân on Reedham Ferry, as we set off on a half bike ride to Norwich. Tandem 99 was the other side of Norwich at Reepham. 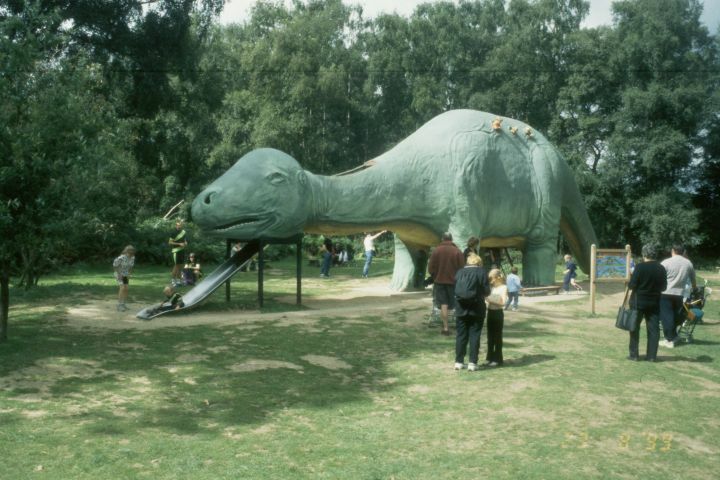 The ride on the Monday went to the Dinosaur park at Weston Hall. Ceri-Siân is sticking her head out of the body of the wonderful slide, which I found great fun as well. The time in Norfolk was cold, we had a frost and I had to resort to PYJ's! So after Tandem 99, Ceri-Siân wanted to go to Nanny's, so we dropped her off and then went to the Mildenhall Rally. 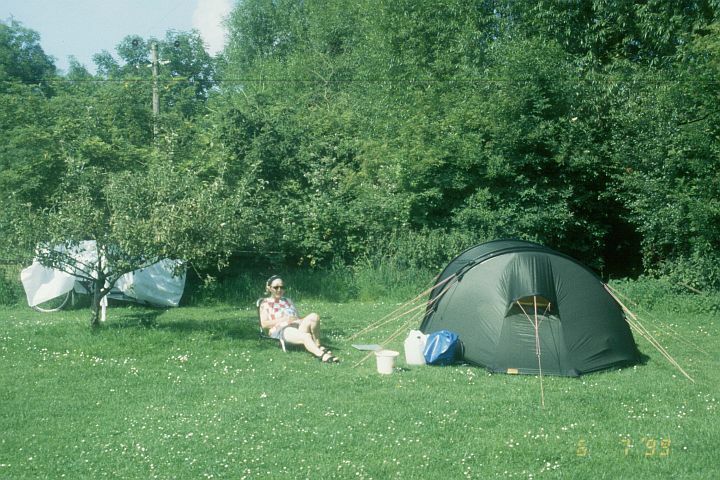 We camped at Long Row, which was at the end of Mildenhall airfield as occupied by the US. 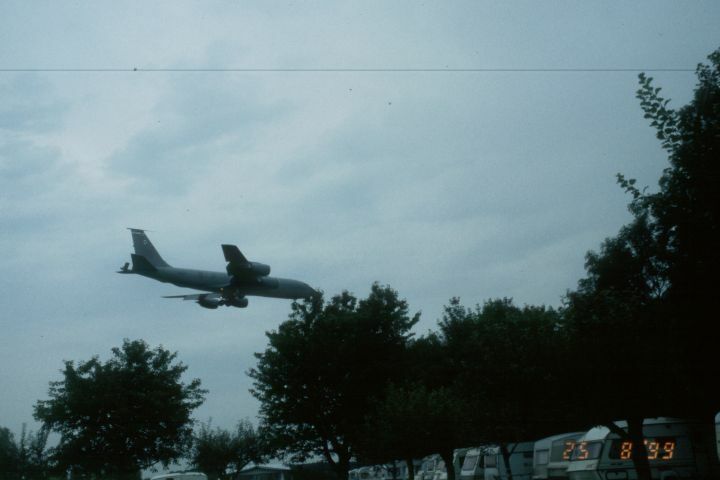 This was a typical view of a plane landing - you could almost see the whites of the pilots eyes! The airbase was busy during the week, but went quite early on Saturday morning. In September we had a wet weekend with our friends in Oxford. They took us to a Woodland Craft event at . 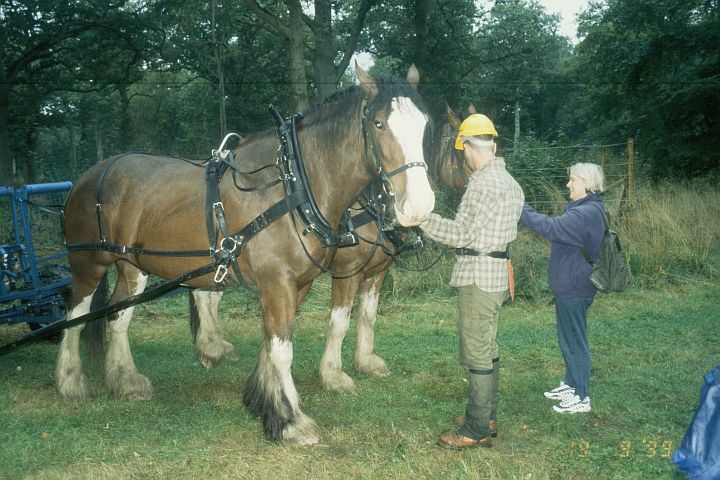 Here is Ann offering up a sugar lump to a pair of heavy horses. In September we had a wet weekend with our friends in Oxford. They took us to a Woodland Craft event at. 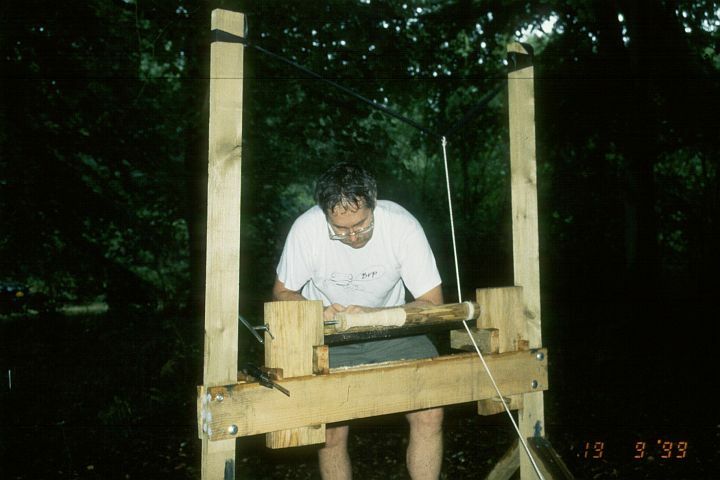 This is me turning a baseball bat using a treadle lathe. 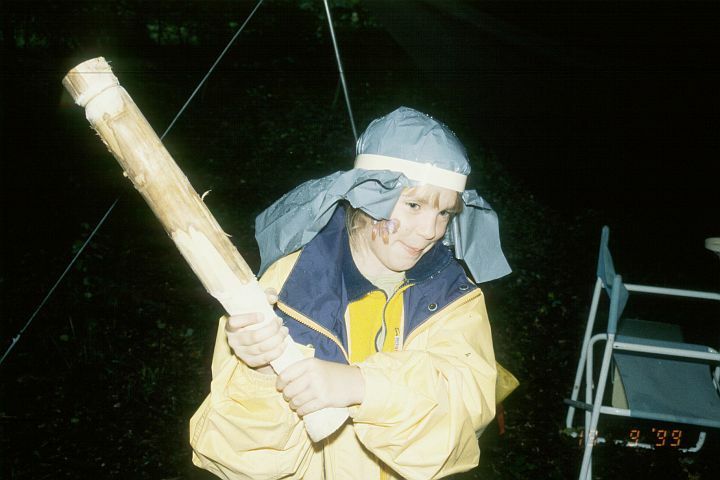 Ceri-Siân trying out the bat for size and weight!